I’d like you to meet my two mentors, Stuart Ross and Jay Kubassek. They're the co-founders of the Six Figure Mentors (SFM) and Digital Experts Academy (DEA). Stuart Ross, a.k.a. The Freedom Entrepreneur, found and streamlined an online business system. He has helped people all over the world become digital experts, so they too, can achieve the lifestyle freedom he's so passionate about! Jay Kubassek, a.k.a. 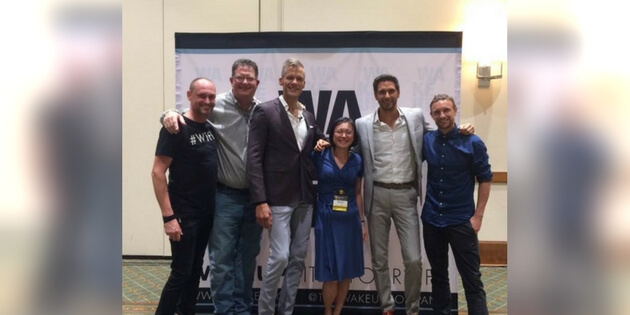 #aWAKEUPcall, who grew up on a farm, has mastered the digital business system that changed his own life! He now creates major impact to people’s lives through his digital business know-how. Jay’s #aWAKEUPcall platform is dedicated to empower people with the confidence they need to achieve their dreams. The Six Figure Mentors (SFM) is a digital business system and a cutting edge online marketing education program. It teaches people to be online entrepreneurs, and offers them the opportunity to promote life-changing products as an SFM affiliate. If you are looking for a sustainable online business that suits your lifestyle, look no further! SFM is a legitimate business model and is compliant with US Business Opportunity Law. Best of all, you can create your own account to take advantage of the 30-Day FREE test drive. This gives you peace of mind while you explore the SFM system. You’ll be able to join our exclusive SFM community, including Live Weekly Webinars with SFM’s top digital marketing experts. The 7-day video training series on how to build a successful online business. Full access to the cutting-edge Digital Skills Platform - with short lessons on online skills. You can even learn them while on your coffee break! Your very own dedicated SFM Business Consultant to support you every step of the way. You deserve to do what you love, create a business around your ultimate lifestyle! We can help. Copyright © 2019 - Bright Luc Media LLC - All Rights Reserved. Individual results vary from person to person. We DO NOT make any guarantees.